Come relax and de-stress with a gentle four-legged friend. 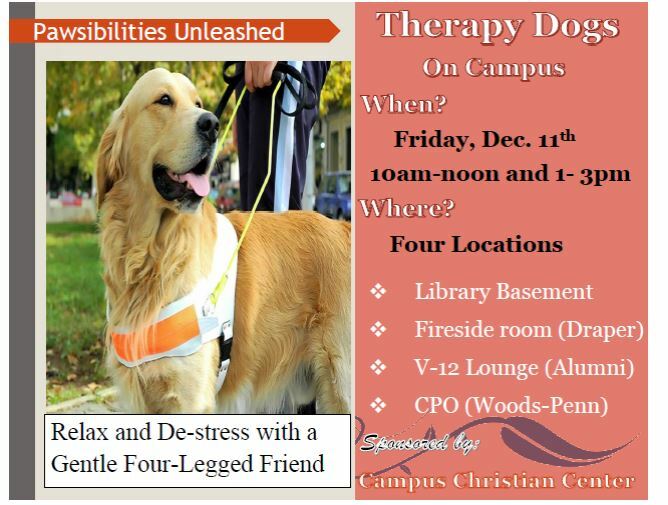 Therapy dogs will be visiting Berea College on Friday December 11th, 2015. The dogs will be here from 10:00am to 12 noon and 1:00pm to 3:00pm. The Fireside Room in Draper Hall. The V-12 Lounge in the Alumni Building. The CPO area in Woods-Penn Building. The event is sponsored by the Campus Christian Center.